Nasi Goreng is the Indonesian version of fried rice, it is one of the most popular all in one meal in Indonesia and other neighbouring places, Singapore and Malaysia who got their own version of this all in one meal fried rice. A day old rice is stir fried with sambal belacan made up of powdered and toasted dried krill and hot red chili paste. An Indonesian sweet thick soya sauce called ketchup manis is also added, Other vegetable, meat and seafood ingredients may be added, and garnished with crispy fried garlic slices. Nasi goreng is served with sunny side up fried egg and kerupuk an Indonesian shrimp or fish crackers. 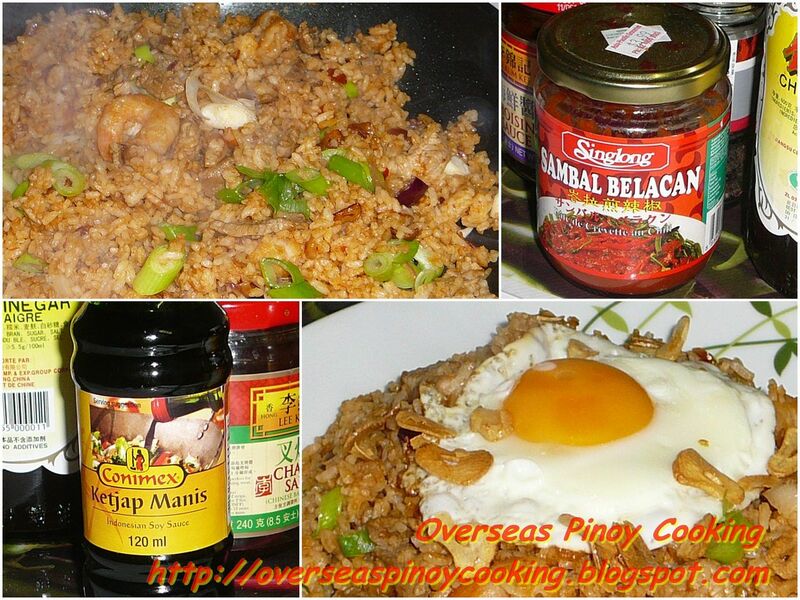 For my version I used bottled sambal belacan which is now readily available in supermarkets and Asian stores. The quantity defends on how much heat you could take. I also added pork cutlets and some shrimps. you may use chicken if you want. Here is my Indonesian Nasi Goreng recipe. In a wok fry the sliced garlic until crispy, remove half of the fried garlic from the wok, keep aside. Add in the onion and stir cook until soggy. Add in the sliced meat and stir cook for 2 to 3 minutes, add in the sambal belacan, sweet soya sauce, shrimp and stir cook for another 1 to 2 minutes or until oily. Now add in the rice and continue to stir cook for 3 to 5 minutes or until the rice is evenly coated with the sauce. Add in the spring onion and stir fry for another minute. Remove from wok and serve with fried egg topping and garnished with the reserved fried garlic.